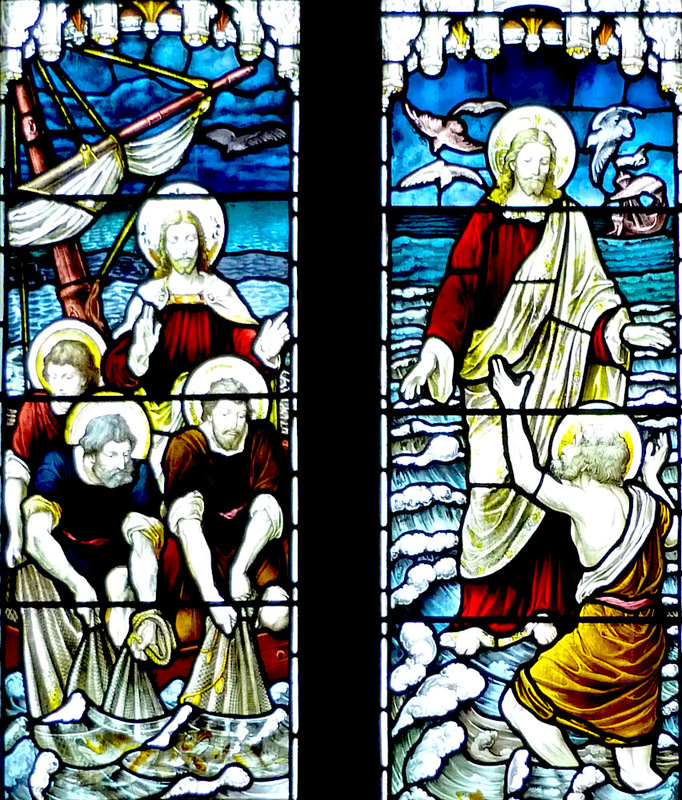 Eternal Father, Strong to Save, a three-light window in the parish church of St Mary Magdalene, Sandringham, in the south transept added to the medieval church by Sir Arthur Blomfield after the estate was acquired by the Prince of Wales, later King Edward VII. 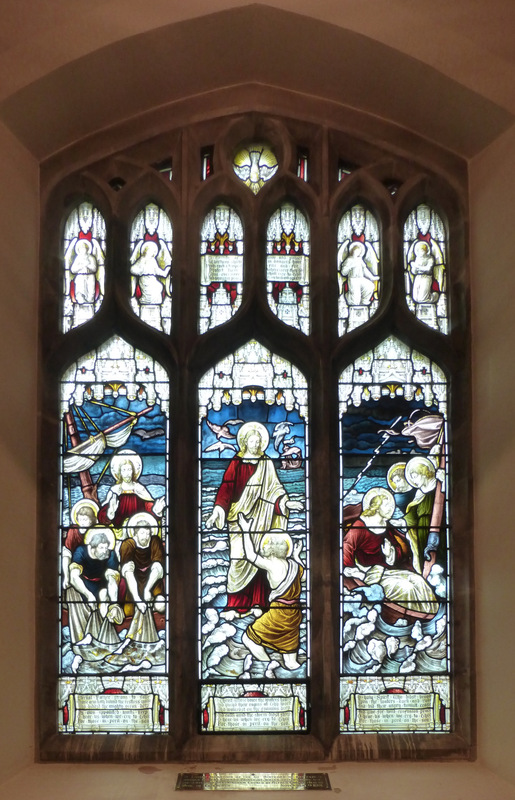 Given by the sea-faring Prince Alfred in honour of his brother Edward's 50th birthday in 1891, it shows three miracles of Jesus associated with the waves: the disciples drawing in a haul of fish, Peter walking on the water, and Jesus calming a storm. Rigging, seabirds and lightning make appropriate backgrounds, while underneath run verses of William Whiting's hymn for those at sea, starting "Eternal Father, strong to save, / Whose arm doth bound the restless wave" — every sailor's favourite hymn, and the traditional "Navy Hymn" of both Britain and America. Whiting was a master at Winchester College, who wrote the hymn in 1860, probably inspired by the treacherous storms of 1859 ("Eternal Father"). The focus in this church is generally on the rare much earlier glass, and Pevsner and Wilson actually dismiss the later glass as run-of-the-mill, but this is a beautiful window, and Canon Ashton shows it in a full-page illustration in his guidebook to the church (on p. 15). Other windows here are also, most probably, by the same firm. Photographs and text by Jacqueline Banerjee. You may use these images without prior permission for any scholarly or educational purpose as long as you (1) credit the photographer and (2) link your document to this URL in a web document or cite it in a print one. Ashton, Canon Patrick. The Church of St Mary Magdalene, Sandringham. Peterborough: Jarrold, 2008. "Church of St Mary Magdelene." British Listed Buildings. Web. 10 October 2018. "Eternal Father, strong to save." The Canterbury Dictionary of Hymnology. Web. 10 October 2018. Pevsner, Nikolaus, and Bill Wilson. Norfolk 2: North-West and South (The Buildings of England). New Haven and London: Yale University Press, 2002.